Comments: Broadleaf deciduous large bush to small tree native to central China. Ovate leaves with 3 to 5 small points, serrated edge, and red petiole. 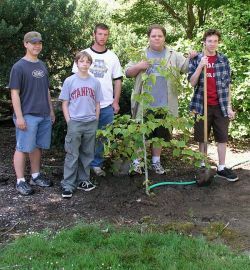 This specimen was planted June 11, 2005 to replace a similar tree known to be planted in the park. The original tree was on Fremont's Landmark Tree List.